Each of these sketches was done during approximately 30 minutes and then the watercolor wash was added later. We saw Antony and Cleopatra at the Globe Theatre Bankside and had 30 minutes to wait along the embankment - with a wonderful view of St. Paul's Cathedral across the Thames. 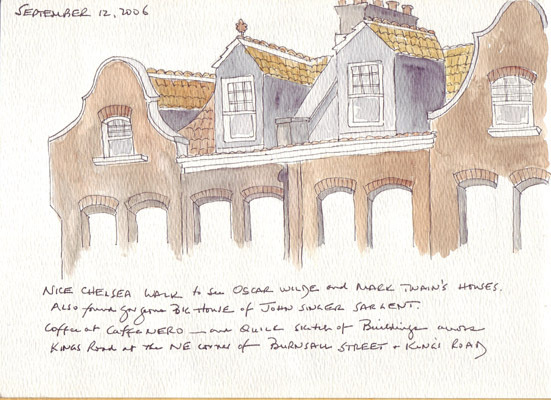 The second sketch is the roofline of houses along King's Road in Chelsea - directly across from Caffe Nero where we were having coffee. 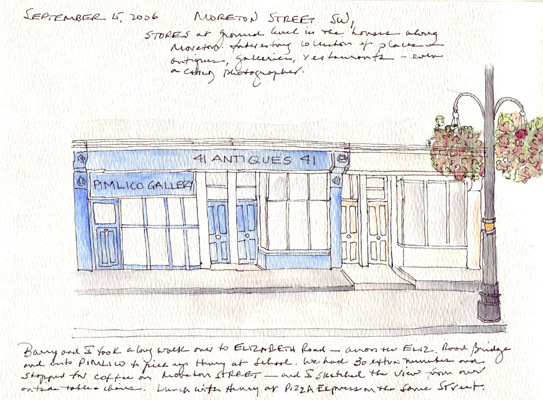 The last sketch is a row of interesting shops across from another small cafe with outdoor tables in Pimlico. My husband can be encouraged to stop for coffee while I sketch and he does a NY Times crossword puzzle. 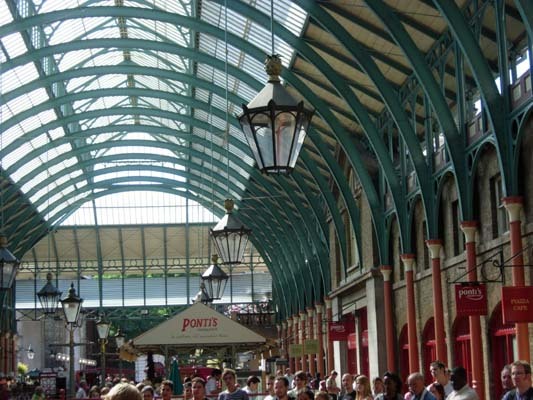 When we visited London for the first time in January 1970, we were intrigued by the market at Covent Garden and loved eating lunch in the area restaurants. We attended a performance of the Royal Ballet - one of our favorite ballet companies- and the entrance seemed to be right in the middle of the hustle and bustle of the market. 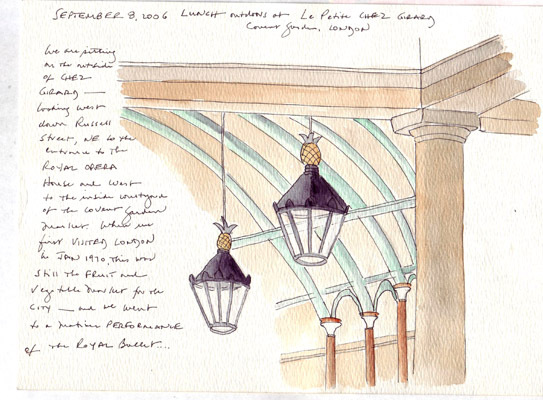 In July we returned to Covent Garden on a very hot Sunday afternoon and were so disappointed. The market was gone, it was jammed with tourists, and globalization had replaced the very English establishments with the equivalent of an American mall food court. In September we decided to return yet again on a cool weekday afternoon for lunch and spent a very pleasant hour at Le Petit Chez Girard's court level outdoor cafe. This was one of the views from where I sat and sketched. 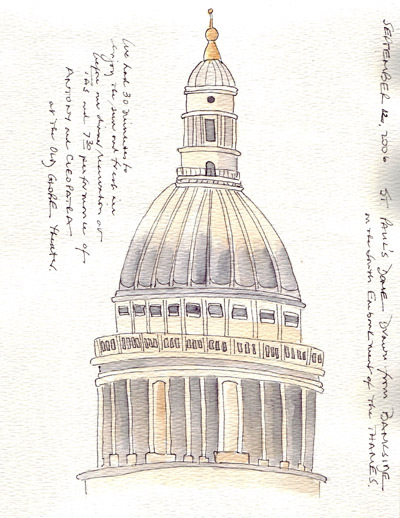 More Sketches from our recent London visit. 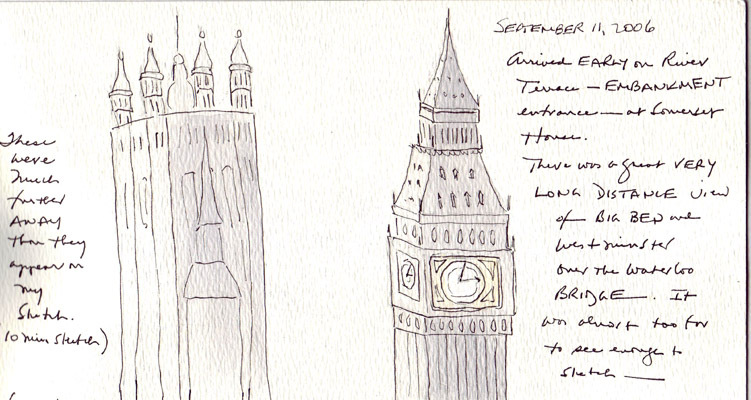 Sketch 1: Parliament and Big Ben as seen across the Waterloo Bridge from Somerset House. They were both so far away that only a guess could be made re: the actual structure. We visited the Courtauld Institute of Art and the Gilbert Collection Tiffany Exhibit at Somerset House - both were terrific. 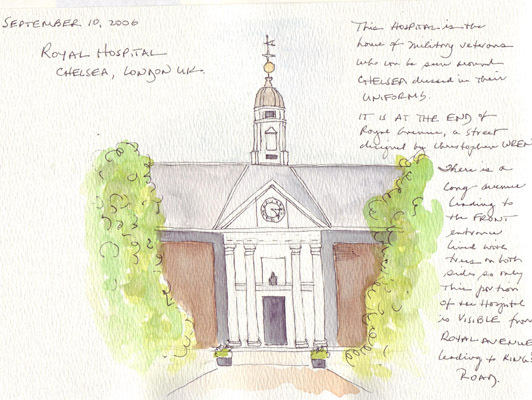 Sketch 2: Royal Hospital - designed with Royal Avenue by Christopher Wren as a home for elderly soldiers. 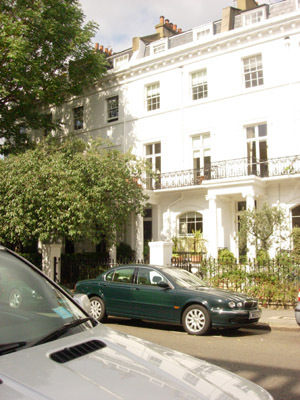 It is fun to see many of them walking along the streets of Chelsea in their old uniforms. 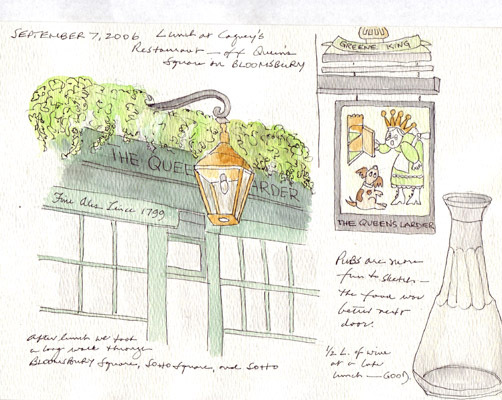 Sketch 3: A pub near Queen's Square in Bloomsbury. We had a quick lunch at the adjacent outdoor restaurant, but the pub was much more interesting to sketch. I have never sketched/painted water, and don't believe that my skills are up to it yet. In addition, the only outdoor water I saw during the challenge week was the muddy brown Thames in London and it looked gross. 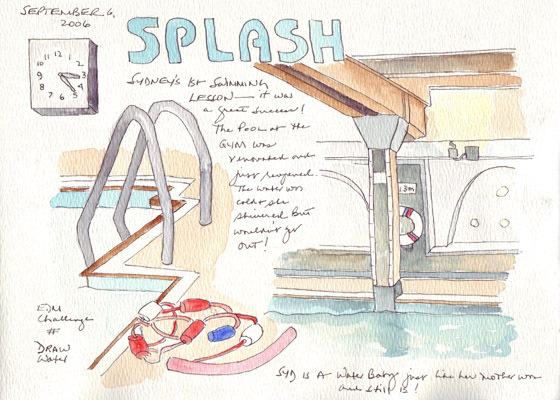 I did accompany my 21 month old grand daughter to her first swimming lesson at an indoor pool and decided that was going to have to be my sketch for this challenge. You have to look really carefully to see the small patch of pool water on the bottom right! The beautiful blue color of the water was of course due to the colors of the pool tiles and walls. 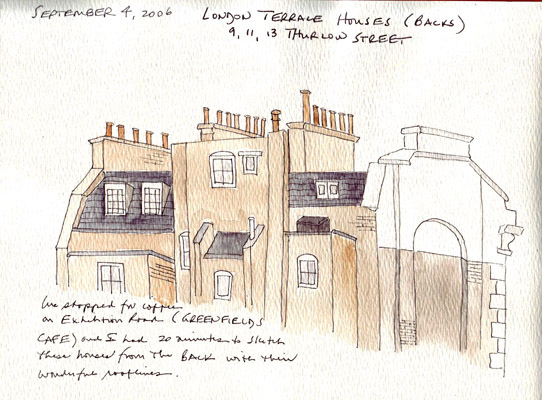 I sketched the roofline of 3 houses on Thurlow Street, near the V and A Museum, while we stopped for a cup of coffee. The number of fireplace chimneys on each terrace house in London is impressive and I wanted to remember the great roofline. The sketch shows houses at #13, 11, and 9 (from left to right). The photo shows the fronts of the same houses (L to R #9, 11, 13).